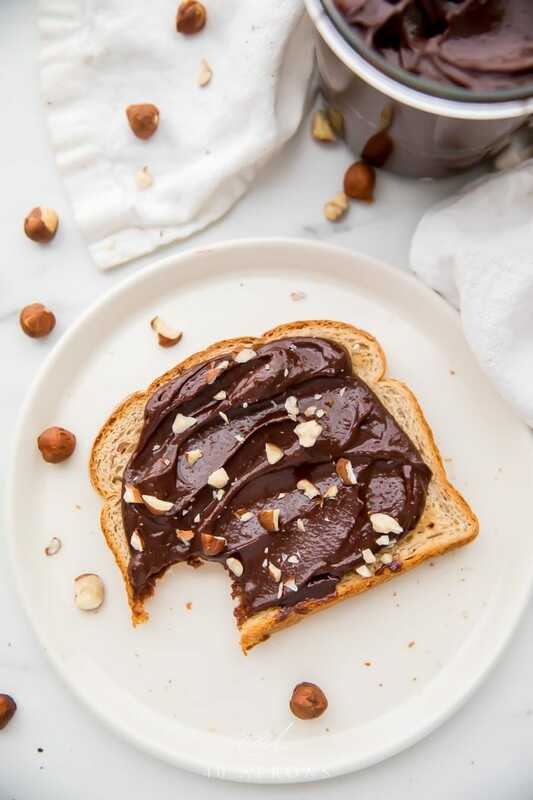 This vegan Nutella tastes just like the chocolate hazelnut spread that everybody loves, but it’s paleo, dairy free, refined sugar free, grain free, and way healthier! 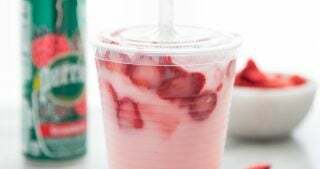 Great with just about everything and super easy to make. Nutella is one of those treats that so many of us eat “despite” our otherwise great, healthy diets. It’s worth it, right? I mean… I’m not saying no. Nutella is creamy, rich, chocolatey perfection, and that’s a basic tenet of humanity. Except you can make it yourself. Really easily. Paleo and vegan both! Did I mention it’s super easy? It’s super easy. 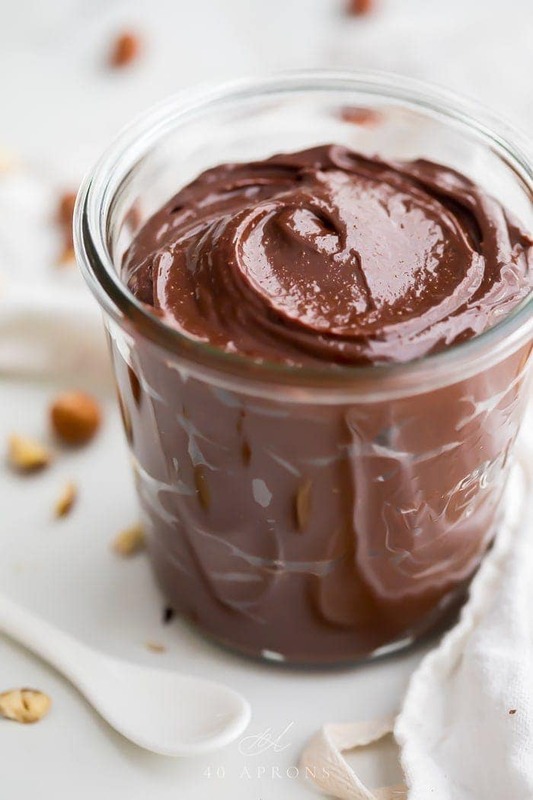 Not only is this homemade Nutella vegan and paleo, but you actually know what’s going in it.. and so you don’t feel quite so bad smothering your toast (or apples or cereal or fingers… whatever, I don’t judge) in the stuff for breakfast, followed by a breakfast-dessert of a spoonful straight from the jar. It’s as chocolatey and rich with toasted hazelnuts and real chocolate as the Nutella you’re used to. 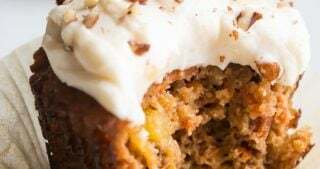 It’s made with just a few ingredients, like vegan or paleo chocolate, hazelnuts, coconut oil, maple syrup, vanilla extract, and a pinch of salt. 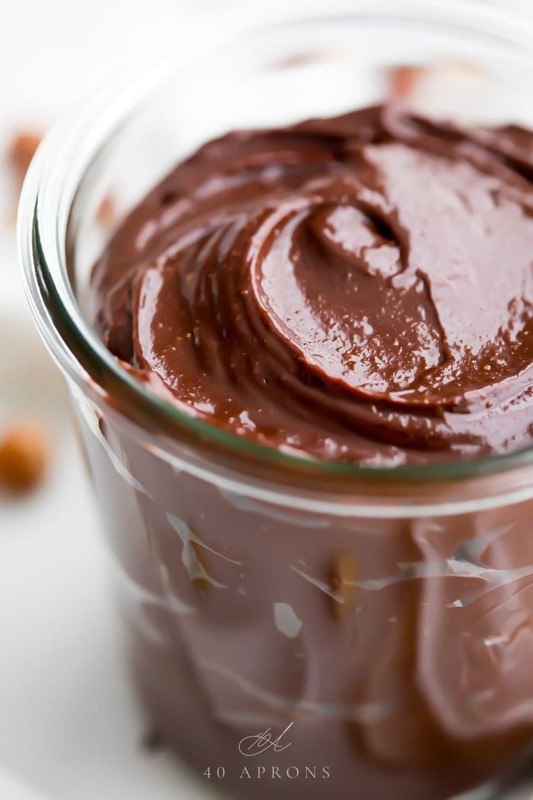 This vegan Nutella is surprisingly easy to make, and most of it happens in the blender or microwave. 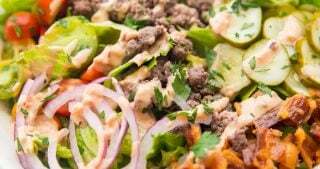 The recipe is vegan, paleo, and there’s even a low carb option. You’ll love the rich nuttiness of the toasted hazelnuts and how the flavor dances brilliantly with heady dark chocolate, the bitterness balanced with a bit of maple syrup and aromatic vanilla. This, my friends, is Nutella. Plus, did you know that coconut oil is actually considered to have multiple health benefits? 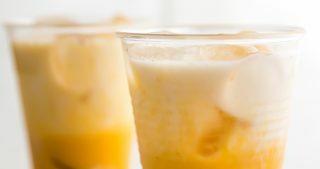 I don’t think that means we should all go guzzle a cup, but it’s been shown to contain a unique combination of fatty acids that boast medicinal properties and its medium-chain triglycerides can actually help you increase energy expenditure compared to other longer chain fats. For more health benefits of coconut oil, check out this article at Authority Nutrition! Vegan Nutella with coconut oil? You. Are. Welcome. There’s really only a few simple steps. Start by roasting a cup of hazelnuts on a baking sheet at 350º F for about 12 minutes. You want the papers to turn a darker brown and the hazelnuts themselves to become almost a very light brown. Remove from the oven and let cool slightly, then remove the skins from the roasted hazelnuts. I like to do this by pouring the filberts (That’s just another name for hazelnuts!) onto a kitchen towel, covering them up, then rubbing the hazelnuts to loosen the skins. Then, just remove the skinless hazelnuts from the little nest of papers that will be left over. Meanwhile, melt your chocolate and coconut oil in a medium bowl in the microwave. Microwave 60 seconds, stir well, 30 seconds, stir well, then continue in 30 second bursts until just completely melted, stirring well in between each round. Transfer peeled hazelnuts to a blender and process until ground fine. Stir in the melted chocolate and pulse until combined. Pour in the remaining ingredients: maple syrup, vanilla extract, and salt. Blend until very smooth. If the mixture is too thick to process well, add in your desired milk, like almond milk or macadamia milk. Add in a couple tablespoons at a time then process until smooth. Repeat until the desired consistency is reached. I use about 4-6 tablespoons usually. Scrape out of the blender and transfer to a jar. Keep in an airtight container at room temperature for at least 1 week. Use the tamper that comes with your blender to really press the mixture down. 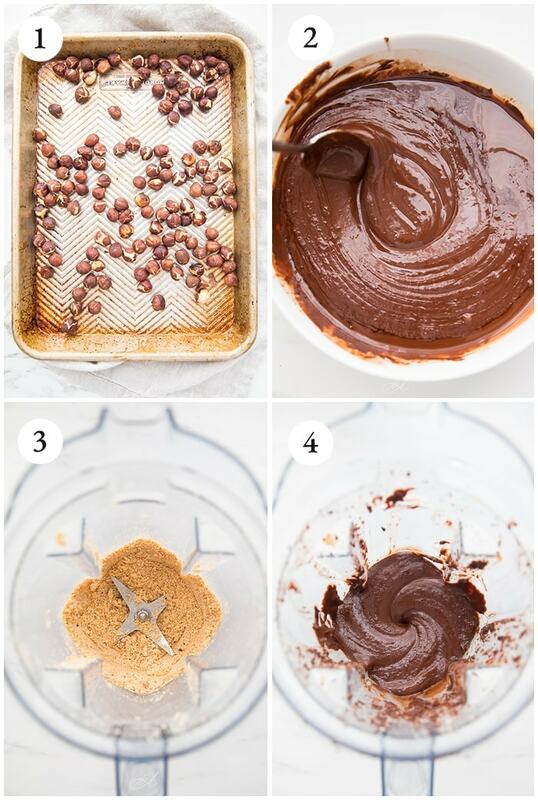 This will help you create a super smooth vegan Nutella. 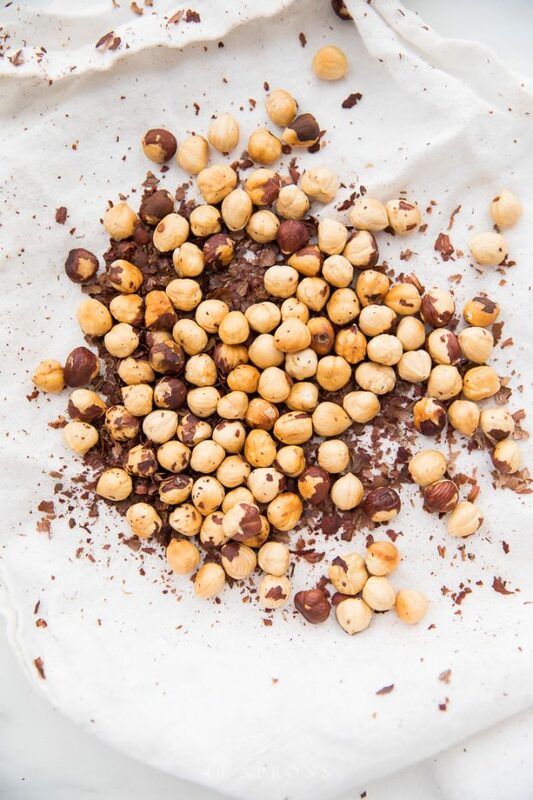 To easily remove the skins from the roasted hazelnuts, lay open a kitchen towel and pour the nuts into the center. Fold the towel over and rub the hazelnuts vigorously. Open the towel up, and the skins should mostly have come off. It’s OK to leave a few on. Pick the nuts out and proceed with the recipe, discarding skins. Be careful with melting your chocolate. Use a bowl that’s wide enough so that the mixture is not more than about 1″ deep. Microwave 60 seconds first then in 30-second bursts after. Stir very well in between each burst. Not following these directions can lead to the chocolate seizing up and becoming grainy. 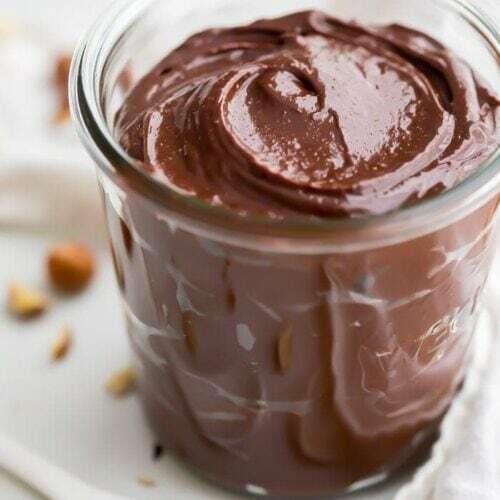 What to Eat with Vegan Nutella? On a bagel with crumbles of goat cheese and raspberries. TRUST ME. Hey – you’ve made it this far, and now we’re best friends! 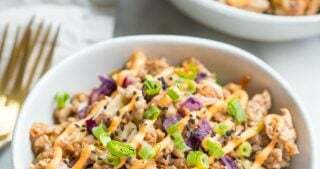 If you make this recipe, I’d love for you to give it a star rating ★ below. Make sure you follow me on Instagram, Pinterest, and Facebook, too! A vegan taken on the chocolate-hazelnut spread Nutella, made with only a few simple ingredients, quick and easy. 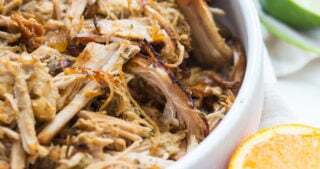 Paleo and low carb friendly. 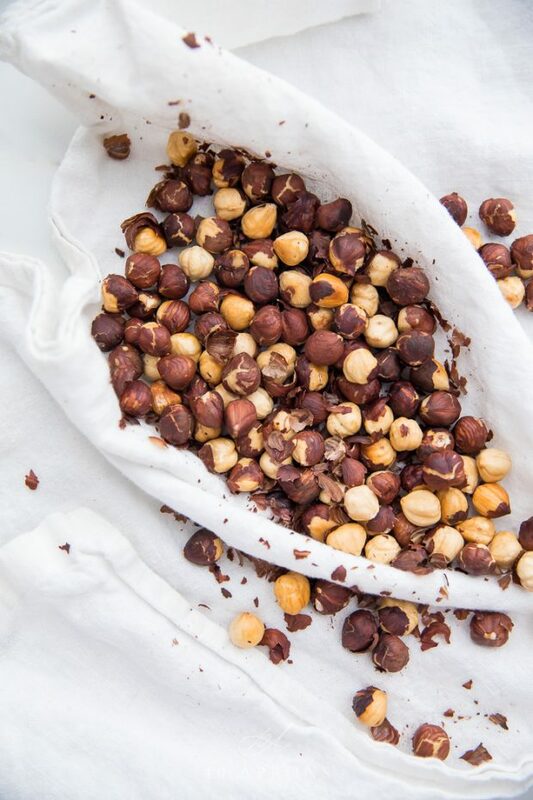 Spread hazelnuts in a single layer on a baking sheet and toast in the oven about 12 minutes, until they've browned a little and the skins are popping off in places. Let cool slightly then remove skins, either by pinching between fingers or by wrapping hazelnuts up in a kitchen towel completely and rubbing to remove papers. It's OK if a few stay on. Meanwhile, melt the chocolate and coconut oil together. In a wide, medium bowl, microwave 60 seconds, then stir. Microwave 30 seconds then stir, continuing with 30-second bursts, stirring well in between, until completely melted. See Note for help with melting the chocolate. Alternately, melt chocolate and coconut oil together over a double boiler. Add peeled hazelnuts to a high-speed blender and process until finely ground. Pour in melted chocolate and pulse until combined. Add in maple syrup, vanilla extract, and salt, processing until smooth. Pour in non-dairy milk, about 2 tablespoons at a time, blending well in between each addition. 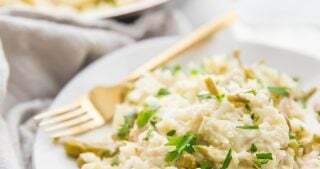 Continue adding until the desired consistency, about 4-6 tablespoons. Scrape out of blender and transfer to an airtight container. Keeps in an airtight container at room temperature at least 1 week. If you're strictly paleo, use a paleo chocolate like Pascha Dark Chocolate Chips. You may need to add more maple syrup to offset the unsweetened chips. 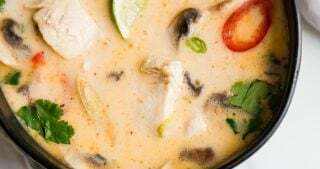 You'll need non-dairy milk to thin the mixture. I like unsweetened vanilla macadamia milk or almond milk. Coconut milk would be delicious here. If low carb, use Lily's Stevia Sweetened Chocolate Chips. Swap out the maple syrup for powdered erythritol, too. Be careful when melting the chocolate. Use a bowl that's wide enough so that the chocolate is not more than 1" deep. 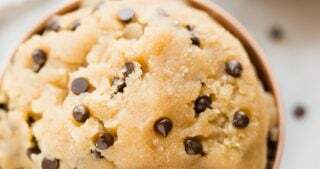 Only microwave the coconut oil with the chocolate chips. Start with 60 seconds then proceed with 30-second bursts. Stir very well in between each burst. 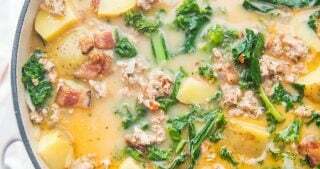 Update notes:This recipe was originally posted May 2014 but was updated with notes, new photos, recipe alterations, and new content April 2019. Actual OMG. I lived in Scotland for half a year, and spent a month travelling Europe and much to my stomach’s dismay, lived off of Nutella. Thank goodness I never took the time to look at the ingredients. I’m not vegan, but I try to limit dairy and especially ingredients of which I don’t know what they really are. I will be making this ASAP. Ha, I love that reaction! I’m right there with you–I probably still wouldn’t even eat a vegan Nutella if they came out with one! Too many funky ingredients, and it makes me even more suspicious because Nutella tries to push how “whole” it is–until you look at the legally mandated list of ingredients in their actual order. Yech! Let me know how you like it! Ha! Yeah, it’s pretty all-around not the healthiest, and there’s something so much more wholesome and even richer, nuttier than the canned stuff. I bet it would be just phenomenal in ice cream!